A maritime disaster prompts unspeakable human behavior that has political ramifications in post-Napoleonic France. The stranding of the frigate Medusa on a sandy shoal off the West African coast in the summer of 1816 was history’s most documented and controversial shipwreck before the sinking of the Titanic. Miles (David Jones, 1996) not only parses the event itself, but examines its broader impact on a French nation in sociopolitical turmoil as the deposed Napoleon was succeeded by a restored Bourbon, King Louis XVIII. The Medusa’s lifeboats could not accommodate everyone on board; some 147 passengers and crew were relegated to a makeshift raft. Captain Hugues Duroy de Chaumareys, whose neglect had caused the wreck, promised that five lifeboats would tow the raft to the coast, but it was soon cut loose and abandoned, apparently on his orders. In the two weeks that followed, violent conflict erupted on the raft between appointed leaders and the rest; dwindling supplies of water and food led to acts of cannibalism and, ultimately, outright murder of the injured and infirm to conserve resources for the fit. Only 15 survived. 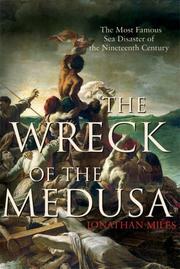 One of them, engineer Alexandre Corréard, coauthored a bestselling account of the Medusa disaster. Republican opponents of the restored monarchy seized on it as an example of royalist corruption and incompetence. Corréard’s book also inspired Romantic painter Théodore Géricault to produce the monumental The Raft of the Medusa, still one of the Louvre’s principal attractions. Miles ably marshals the sweep of these events and documents how Corréard’s text and Géricault’s painting ratcheted up the political conflict. Diligent deconstruction of a shipwreck and a scandal.